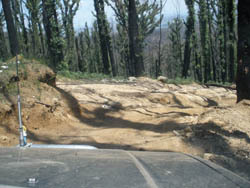 Robertson\'s Creek FireTrail has been reopened since the Feb 2009 fires. Since then, a grader has been through and the area is very different to what it was 12 months ago. The firetrail runs from Forest Road adjacent to the trialbike unloading area through to Sth Hells Gate Track. It passes Rocky Track, Bullock Link Track and several others along it\'s route. There is a steep and rutted section just past the Rocky Track intersection that would be classed medium in the dry, but difficult in the wet. This is a steep and rutted area. The rest of the track ranges between reasonably flat through to short sections of very steep. Great fun doing this track from either direction. It is mainly uphill from Forest Road and downhill heading back.